FIRE Light Group: Snow Carnival? I was recently invited to Quebec City to experience their famed Winter Carnival. I know what you are thinking- a carnival in Canada in the winter? Yes! It was amazing and I thought I would share some of my experience with you. Quebec is a beautiful place. Mostly French speaking, the province is known for its gorgeous scenery and its outstanding gastronomy (artery-clogging yet delicious poutine notwithstanding). And you cannot forget the absolute sweetness and generosity of the people! Canadians are the nicest people in the world, I am absolutely convinced. Anyway, on to the tour! Our first stop was the famous Hotel de Glace (Ice Hotel) which, as the name implies, is completely made out of ice and snow. We took in the chapel which was a beautiful room with real deer hide-lined ice benches and an ice altar. It was absolutely gorgeous and a real technological feat! There are approx 35 sleeping rooms in the hotel plus an ice slide, a spa and two bars. I personally couldn't imagine sleeping in one of those beds (an actual mattress on top of an ice foundation) but I am sure there are some who would find it quite the adventure. After the Hotel de Glace, we went out to the Sugar Shack which makes some of Quebec's world-famous Maple Syrup. After learning about the syrup making process (did you know that they use the sugar water out of the tree- NOT the sap? ), we sat down for a nice down-home style lunch accompanied by a fiddle player. I felt for a moment like I was back in WI! While still on our sugar-high from the Shack, we got the rare opportunity to see the "Behind the Scenes" of the Winter Carnival. 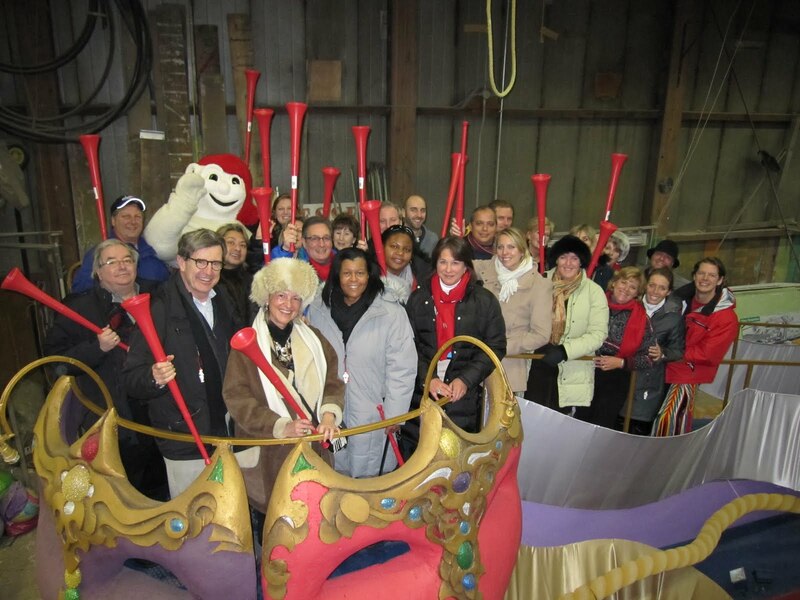 We drove back to the city and visited the warehouses where they were constructing the floats. It is very strange! You never think about parade floats being anywhere other than on the road. Below is a pic of one of our hosts for the weekend, Nicky de Champlain of JPdL getting eaten by a giant worm. The whole group on one of the floats! We also got the opportunity to attend the Bal de Bonhomme (the Bonhomme Ball) which is a black tie event in Quebec City. It is held every year during Winter Carnival at the iconic Fairmont Le Chateau Frontenac. With an expertly prepared 5 course meal, we were full before we even got to the main course! Only around 350 guests are able to attend this dinner and dancing event, including some big shots like the 2010 Olympic women's speedskating silver medalist, the president of the Tourism Board and the head of the Alcohol Bureau. And, of course, Bonhomme. It IS his ball after all! We were very fortunate our hosts were so amazing or we never would have had the chance to enjoy this rare treat! The next day we took a short city tour and visited the Old Town area. What a great stop! There are a few old-Europe looking streets filled with artisan shops. All of the shops are locally owned and part of an artist co-op. And the best part was, the prices were very reasonable. I really love picking up original art direct from the source- especially when you aren't paying the "tourist premium". In the center of the old town area is this really cool church. If you look closely you'll notice it is the church used to film the scene in Catch Me If You Can where Frank Abagnale Jr. is finally captured! For lunch, we ate at Loews Hotel's revolving restaurant where we got panoramic views of the city and carnival grounds. With horse-drawn sled rides, a snowmobile course, a fully-lit ice castle, a zip line, slide runs, concerts, snow sculptures, dogsled rides and skating areas, the carnival grounds cover at least a square mile. And, much like Santa, Bonhomme finishes the parade! After the parade we headed back to the hotel in a driving wind storm. Thankfully we had had enough delicious Canadian wine at dinner to keep us warm for the trek! Windblown but happy- with Quebec City Tourism's Sebastien Cornellier, a truly fantastic gentleman! A sad but beautiful ending to our trip to Quebec City- taken from our room at the Hilton Quebec. A HUGE Thank You to JPdL, Quebec City Tourism, the Canadian Tourism Commission, the Hilton Quebec and all of the other venues that showed us the true spirit of Quebec City. I (and my grandmother!) can't wait to come back.